I wanted to eat at Le Cafe Michi for a very long time. However, it is located at a neighbourhood that I rarely frequent so the only time that I would drag myself over is on weekend evenings. Of course the whole place would be booked and I would end up trying to find another place. By some lucky coincidence, I decided to have an impromptu track hop in Scarborough after work today. I'm currently looking for a nice track to practice inline skating that's closer to my home. From Google Map, there are a few in that area that look very promising. Alas, none of them are in skateable condition. However, I wouldn't pass up an opportunity for some good sushi so I quickly found myself sitting at one of the tables at Le Cafe Michi on this Wednesday evening. Most of the dinner menu are sets including salad, main dish, and a slice of cake (btw, here's a nice site on types of Japanese restaurants), ranging between $15 - $25. I'm not in the mood for nigiri sushi tonight but neither do I want to fall back on my favourite standbys such as oyako don or curry rice. The deluxe "Cafe Au Lait Chirashi Sushi" sounds amazing so that's what I decided on. 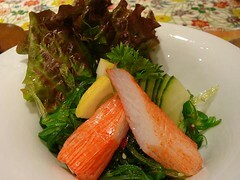 Instead of the garden salad, it was served with a special chef's salad made with a tangle of vinegared seaweed. It was very appetizing indeed. My bowl of chirashi was piled high with pieces of sashimi including salmon, salmon roe, tuna, scallop, octopus, ebi, tamago, unagi, and a cute little tuna with mayo nigiri sushi ball. The selection of fish was not particularly adventurous but the quality was very high. I enjoyed the ebi shrimps the most because they were so fatty and sweet! The salmon roe was not as salty as I expected and they tasted so fresh. The smokiness of the broiled unagi buried deep in the rice was like a hidden treasure. The seasoned rice was a little less sticky than your typical sushi rice but it was so delicious that I ate every last grain. All the cakes at Le Cafe Michi are baked in-house so of course I was eager to give them a try. There are so few Japanese-style pastry shops in Toronto (La Bamboche, Bakery Nakamura) but personally I think the delicate and subtle characteristics of typical Japanese-French cakes should be popular with anyone. The most interesting flavour was Chocolate Sake Mousse Cake. Even though I'm not a big fan of chocolate, I was curious enough about this cake to choose it over Bailey's Cheesecake, Blueberry Cheesecake, Strawberry Shortcake, Cappuccino Cheesecake, and Green Tea Mousse Cake. 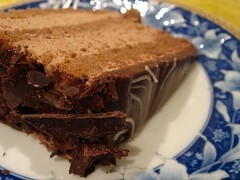 The thin layers of cocoa genoise were moist with a syrup spiked with sake. The mousse was very airy but the chocolate flavour was subtle. The ganache on the top of the cake and the dark chocolate shards both helped to boost the chocolate quotient. I love the cozy atmosphere and the great value here. 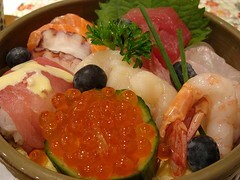 On days when I crave sushi yet too lazy to drive downtown to Ichi Riki, Le Cafe Michi would be a wonderful alternative. I'm looking forward to come back on a weeknight for another quiet dinner. Work is a little stressful recently. I'm the sole developer on a highly visible project with an aggressive deadline. Due to an implementation decision that I made, most of the team involved preceives that I made the project more risky than necessary. In short, I have a lot at stake hanging by the success/failure of this project. A telltale sign is that I literally jump every time my phone rings because I fear that it is one of those "the sky is falling"-type of call from work. The last time I got so paranoid was at least two years ago. On the home front, I stopped procrastinating and sorted out many tedious but necessary tasks that keep the household running along smoothly. However, there are still a few outstanding items that I need to get to. Baking-wise, I have two big functions coming up. Neither should be overly complicated but that's still stuff to be done. Oh, my annual cupcake baking extravaganza is moving in closer too. I think I want to make lots of ice-cream cone cupcakes this year. My sporting activies are picking up steam again. I have 5 out of town inline skating competitions coming up, one full day of softball tournament, one inline skating road trip, and new training schedule for learning ice speedskating. I'm still undecided about figure skating this year but I have a feeling that this schedule is a little too ambitious. I know that only a few weeks ago I was saying how I learnt my lesson and I wouldn't over-extend myself again like this summer. On the other hand, I always believe that a little stress best brings out efficiency. If I take on more, I would end up doing more. Hmm, I hope this is true. In the meantime, if you see me a little spaced out, a little slow, or a little out of it, chances are I am distracted by the many things crammed into my calender. I ordered 6 dozens of St-Viateur bagels directly from Montreal in the past and people in my office looked at me funny until they tasted the bagels. I guess bagel is one of those food which inspires heated discussion on style preferences (Montreal-style or New York-style?) and bakery loyalties (St-Viateur or Fairmount?). Last Sunday, I was wandering around Vaughan (a Toronto suburb) just for the sake of getting to know a neighbourhood. After a stop at the Real Canadian Super Store (which is overrated btw except for its collection of Joe Fresh Style), I drove west towards the heart of Jewish neighbourhood at Steeles & Bathurst. As I was driving, hunger began to take over and I couldn't help but to pay attention to the restaurants and food purveyors scattered among strip malls and plazas. Out of the corner of my eye, the colourful delivery van from Kiva's Bagel Bakery & Restaurant just gave me a good vibe (yes, I do possess my very own good food radar). After a few U-turns, I finally found myself standing in front of the very retro-looking store. The margin of profits for bakery is razor-thin. My instinct told me that any bakeries that can survive years in the business must be doing something right. I stepped into the store and thought for a minute that I was in a time warp. Between the vinyl chairs, stationery bar stools, and huge wall decals of orange juice and waffles, I thought I was back in the 80's, authentic 80's. Menu items were scribbled on a number of boards around the room. A selection of bagels with cream cheese & kippers, waffles, freshly squeezed orange juice, potato latkes, peorogies, and various egg dishes sounds like perfect brunch options to me. I think it must be the smell of grease in the air because for reasons unknown, I decided to order the greasiest item on the menu, potato latkes with sour cream. 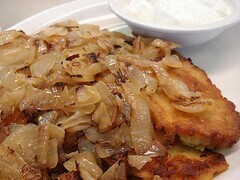 When the dish arrived, I was floored by the pile of fried potato patties and caramelized onions. The aroma was simply irresistable. In fact, two old ladies walked by my table just to admire my latkes! It was funny to listen to their dish-envy but even more useful to follow their advice of ordering eggs with onions next time. The caramlized onions was so soft and sweet. Each latkes was only about 4-inch in diameter, crispy outside and fluffy inside. The creaminess of the sour cream tied everything together and I soon forgot about the grease. It was comfort food to me. Oh yes, back to the bagels. 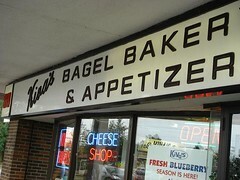 The bagels at Kiva's were chewy and dense by Toronto standard yet what I enjoyed the most was the flavour. It was not eggy and sweet like Montreal-style bagels. Actually, their taste reminded me of the German-style pretzels from Thuet that I love. Although I bought sesame seeds and poppy seeds, these bagels are defintely a savory treat. I think I'll vist other bagel bakeries nearby and do a side-by-side taste-off next time. I heard a piece of news today that made me realize a very important thing: I'm very happy with the way my life is right now. I'm so glad it isn't me in that situation because that's not how I envision my life would turn out. I have so many things that I enjoy and I am discovering more and more everyday. Now that I'm totally over it, I can look back and breathe out a sigh of relief. As ugly as it was, it was a blessing in disguise. I may not know what I want but I am very clear on what I don't want. I eat, I travel, I compete, and I strive to be the best that I can be in everything that I do. I know that someone out there will come to appreciate all that I have to offer. Oh, and I hope I like that someone too. There is a certain charm about a bakery that's been around for years and years, well-known for one particular item that they do very well. 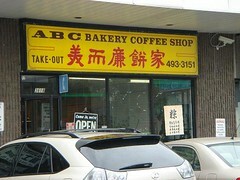 ABC Bakery Coffee Shop is exactly this type of place. Located in a no-longer-popular Chinese plaza, there's really no reason for me to come to this part of town except for their incomparable Cantonese-style custard tarts. While fads such as the yolk-less custard tarts and brulee custard tarts come and go, ABC Bakery stubbornly insists on making one of the best custard tarts in town. Back in my university years, my roommate JH would bring back half dozen of these custard tarts to Waterloo and we would freshen them up in the little toaster oven before devouring the delicious taste from home. Why do I like these custard tarts so much? For one thing, the flaky pastry is made in the traditional way with lard. It is more tender than butter pastry and the flavour is amazing. The custard of these tarts is very delicate with a hint of sweetness. However, the best part is the proportion. The custard is deep enough to jiggle seductively. The pastry is not too thick to overwhelm yet not too thin to get soggy. For a change of things, I also bought a chicken pie for lunch. 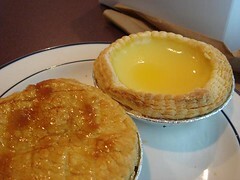 The pastry used in the pie is different than the custard tart, with an almost saffron hue. It is perfect to go with the savory filling. The pie was filled with chunky pieces of dark meat and onions. It's comforting to know that something never changes. I visited A-One Catering after work today to pick up some samosas and mithai (Indian sweets) based on JB's recommendation. Tucked inside a non-descript industrial park, I would never guess that there are stores selling food at all. I got caught up in a few things in the office so by the time I left, it was close to their store closing time. I gave them a call and they were nice enough to stay open for me. I purchased two chicken and two beef samosas. These deep-fried triangles have a lighter than usual shell that's also not quite as greasy. The filling was very moist and more subtly spiced than expected. 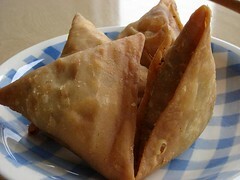 I will have to try their vegetarian samosa next time because I think the potato filling will pick up the spicing better. At $0.75 each, they were an economical nice light meal (ahem, I only ate two. The other two will be lunch for tomorrow). Other than carrot halva, I have not had any mithai since I came back to Toronto after a trip to India last year. The sweets selection at A-One Catering certainly does not offer as many varieties as the sweets store I visited, however, all the usual suspects are there. 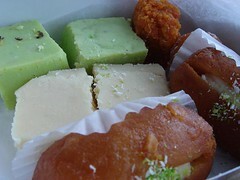 I bought an assortment of sweets including pista burfi, milk burfi, carrot burfi, gulab jamun, and milk cake. There were also rasgulla, jalebi, and many different laddoos available. The milk cake was the best of the bunch with the light scent of spices (kinda reminds me of masala chai) and sweet milk flavour. The burfis were okay although the pista burfi was a little lacking in pistachio flavour. The gulab jamun was unexpectedly dry and crumbly which was disappointing. 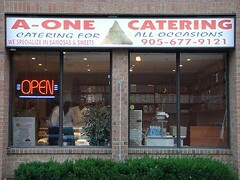 The menu at A-One catering also includes thali for takeout. I may come back for lunch some time. Sometimes, I'm so impressionable it's not funny. 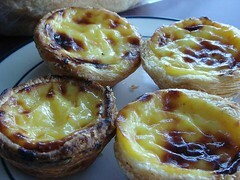 In the last few days, there's been a thread on the Ontario Chowhound board on best Portuguese custard tarts(Pastéis De Nata) around Toronto. Coincidentally, I drove by a Portuguese bakery on my way to a softball game last week. When you put two and two together, how could this series of events not result in an irresistable craving for custard tarts? On my way back from the Ministry of Health office, I made a brief stop at Euro Star Bakery Padaria Portuguesa to check this place out. Two things caught my eye immediately, the stacks of Pastéis De Nata behind the counter and the round loaves of Pão Caseiro. I chatted with the owner a bit and she confirmed that those two are indeed their specialties. The custard tarts are deep and rich with cream. The pastry was very flakey. However, the tarts tasted strongly of artificial vanilla extract which was a little disappointing. The Pão Caseiro is a large round loaf of enriched bread (in the same family as brioche) whose taste and texture remind me of Kugelhopf. The crumb was very tender and open which tempted me to keep tearing bite after bite from the loaf. The owner told me that she has received great praise from natives of the island where this bread is originated. Harey Pattey Ki Chaat (baby spinach, potatoes, chickpeas topped with yogurt and sprinkled with spices): Chaat is one of my favourite food during my trip to India last year. This cold snack/appetizer is usually a mixture of crunchy, starchy, creamy, and tangy. Each bite is a different combination of these taste profiles. 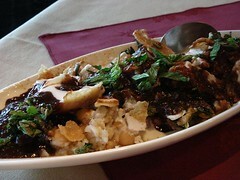 The chaat at The Host is adequate although it is by far not the best that I enjoyed in India or Toronto. Kofta Dikhush (ricotta cheese balls in rich cashew korma and aromatic saffron): This dish is over-the-top rich, so much so that I could barely eat half of it. I was hoping for pieces of paneer but was disappointed to see dumplings of ricotta cheese. Not my favourite. Naan (leavened white flour tandoori bread): Ooh, fluffy fluffy naan. This bread was absolutely delicious and the serving was huge. It was unfortunate that I didn't order a main course that I enjoy to go with such excellent bread. Service at this location of The Host always baffles me. There are so many waiters yet they would walk by my table time after time without taking away the plates emptied of food. Alternatively, it would take forever to get my bill settle after the meal. Suffice to say, I do not put the same level of expectation for service when I enter this establishment...but considering that The Host is one of the more upscale Indian restaurants in Toronto, their lack of attentiveness is a little strange. There are many good Indian restaurants located in this pocket of Richmond Hill. I must give a vote to The Host for having the most beautiful decor of all. However, a girl can't live on ambiance alone. The average food and service are reasons enough to send me to the nearby Jikonee Grillary and Lounge instead. I budget my annual Costco membership as entertainment expense because browsing the aisles of this warehouse usually turns up some unexpected finds. Today, for example, I was wandering aimlessly around the crowded store while keeping my eyes open for new merchandises. In the bakery department, I spotted bread from the famed La Brea Bakery. That's right, Nancy Silverton's La Brea at Costco. It's a little ironic how these artisinal breads ended up in a big warehouse super store. I got a couple loaves of foccacia (they are packaged in pairs, of course) which actually tasted flavourful. I'm not going to comment on the crust because really, I can't expect much assuming these breads were baked from semi-frozen dough at the in-house baking department. 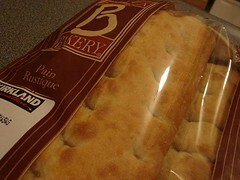 However, if you're interested in trying some La Brea bread right here in Toronto, head over to Costco. In the cheese aisle, I spotted creme brulee in packages of 8 servings for $15.99. At first glance, it looked a little expensive but consider this: the custards were packaged in individual 6-oz glass souffle dishes and made with natural ingredients. The ingredient list actually reads like an ingredient list from a creme brulee recipe! This product comes with little packets of sugar and detail instruction on how to make the burnt sugar topping. I was tempted to buy this since I have a soft spot for custards. Alas, they were too heavy for me to carry in my little shopping basket. Why no shopping carts? This is my little way of preventing overspending. I only purchase what I can carry. One of the demo station had a whole line of duck products which looked very promising. There were rillet de canard, thinly-sliced smoked magret de canard, and many different kinds of duck sausages. Doesn't shopping at Costco sound like a gourmet treasure hunt? Welsh Rarebit - toasted brioche, cheddar sauce, sauteed escargot, parsley salad: This dish was paired with a South African Chenin Blanc that was very citrusy and refreshing to cut the richness of the cheese. The Welsh rarebit was rich and over-the-top satisfying, like the type of food that I wish my grandmother would make (except that my grandmother's Chinese). It tasted like an amalgamation of fondue and escargot, only much easier to eat. I thoroughly enjoyed this dish even though each bite was laced with cholesteral-guilt. Grouper En Papillote With Caramelized Parnips and New Potatoes: This dish was paired with a bodacious (heehee, as you can see I'm not good at describing wine) Sauvignon Blanc with an strong note of rose. Grouper is one of my favourite fish and en papillote is such an old-school but fun way of cooking. The dish arrived with a slighly browned parchment packet, a wedge of lemon, and a small dish of sea salt. Chef Deron Engbers personally brought the dish to my table and snipped open the packet with great fanfare. I love how the natural sweetness of the grouper is highlighted in this dish and the diner is free to add as much or as little salt as he pleases. For me, just a few crystals was enough. The accompanying potato and parnips tasted so buttery. Baked Plum Tart with Vanilla Ice-Cream: Instead of the typical frangipane filling, this version of a plum tart is filled with a beurre noisette-based mixture similar to financier. The acidty of the plums constrasted well with the buttery taste. However, I personally found the tart to be too crispy. The vanilla ice-cream was not memorable. The front of house staff is totally different since I visited Mirabelle a couple of months ago. Although they are all eager to please and enthusiastic about the menu, their knowledge on wine is a little lacking. My dining experience was not affected, however, having the staff run back to co-owner Dion Alpert for advice so often may not reflect so well on a restaurant that bills itself as a gastro wine bar. Mirabelle doesn't disappoint with its attention to food and wine matching. Dion's passion for wine is one of the main draw for me to revisit Mirabelle. For a wine-newbie like me, his wine suggestions are informative and unexpected. He certainly got me interested in wines that I normally wouldn't order. There may be plans in the near future for Mirabelle to collaborate with La Bamboche for an update to the dessert menu. I think this is a great idea to bring higher quality to the dessert selection. Chef Engbers' interpretation of comfort food is just right with a nice balance of refinement and familiarity. I was happy to see the team at Mirabelle has ironned out most of its opening jitters.